Little is known about the beginning our church, the earliest existing record is a membership roll from 1866. 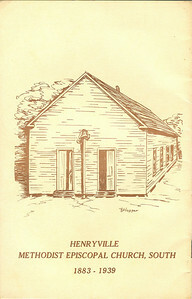 Henryville has been worshiping at its present location since the initial building was constructed in 1883. In 1939, the frame church building was torn down and the existing cobblestone structure was built. Members gathered rocks from the nearby ridges for use in the construction of the Church - "money was scarce, but rock was plentiful." In 1997 with God's grace and provision, the completion of our current sanctuary took place. The Henryville United Methodist Church has been telling the story of Christ for one hundred years at it's present site. On July 20th, 1883, Suzanne and John A. W. Stearnes deeded the two acres on which the church stands to the Methodist Episcopal Church, South. The pastor, Reverend L. H. Leslie, immediately went to Guntersville soliciting material for a building. A building committee of the same Mr. Stearns and Jackson McDonald saw that a wood frame house of worship was completed prior to cold weather. It is said that the lumber for this building was barged down the Tennessee River from Chattanooga and hauled by wagon from Gunter's Landing. The membership moved into the new structure from a log building that stood on Henryville Hill, less that 1/2 mile north. It is thought that land for that site was given by Isacc Henry in 1860. The Henryville Cemetery is located at the site now. Little is know of the church prior to 1883. The earliest existing record is a membership roll dating to 1868. It contains many of the family names that still grace the church roll: Baird, Caldwell, Chandler, Henry, Smith, McDonald, Seibold, Starnes or Stearnes, to name a few. The first pastor on record, the Reverend J. T. Bartee, served the Deposit Circuit in 1872. Conference minutes in 1895, the year of his death, states that he was "a Christian hero who joined the Tennessee Conference at Huntsville, Alabama, in 1844: amiable and intelligent, emulous without folly, and pious without fanaticism, whose long service was greatly blessed to the glory of God and the good of his fellowmen." He was only one of many Christian hero's that served the Church's circuit, often trudging by foot or riding on horseback to dispense the gospel. Another that must be mentioned is John Crawford Hunkapiller who was appointed three times to the circuit. He has the distinction of having served Henryville longer that any pastor on record and perhaps the distinction of having added the most members at one time to the church roll. The local paper, the Democrat, reported in October 1881 that he "had just closed a series of protracted meetings on his little mission resulting in about forty accessions to the Church." At first, the Henryville Church, along with other Methodist churches in the North Alabama watered by streams flowing into the Tennessee River, was part of the Tennessee Conference of the Methodist Episcopal Church, South. It and other churches north of Gunter's Landing were in what is usually called the Deposit Circuit of the Huntsville or Larkinsville Districts. It was in the Larkinsville District when the North Alabama Conference was organized in 1870, the Scottsboro District in 1871 and in 1872 the newly established Guntersville District was renamed Albertville District in 1902. The Church was on a circuit for over 90 years in the North Alabama Conference. It was on the Deposit Circuit first, then Woodville in 1874-75, Deposit/New Hope in 1878, Deposit Mission in 1880-85, Deposit Circuit 1886-92, Columbus City Circuit in 1892-1900, either North Circuit or North Circuit Mission from 1900 on through the 1940's, and Henryville Circuit from 1952 to 1962 when it became a Station Church. The new house of worship, which was finished in 1883, served as a meeting place for religious and social activities. It was the place for public debates, political rallies, Literary Society meetings, and singings. Public school was held in the building, at first for only five months each year due to the bad roads, harsh winters, and seasonal crop harvesting. There is no report of a Sunday School at Henryville until April 1891. It was organized by the Reverend L.C. Sims. Although Sunday School was sporadic in the following years, often failing in winter and being reorganized in spring, the membership at Henryville attained 100 and more. Sunday School programs such as the Annual Children's Day Exercise in May and the Christmas Tree in December were big events, as was the annual Sunday School programs in which pupils of all Sunday Schools in the Circuit participated. At Henryville in the 19th century, protracted meetings and the Brush Arbor Meetings were held often and with great success. Usually these were well attended by all churches on the circuit as well as by people from Guntersville. The Henryville church became a popular site for 'all day' singings and again, people from Guntersville paid ferrage to cross the river and attend. The Democrat first mentioned an all day singing at Henryville in July 1886, reporting that it was quite a success, especially the good eatable dinner spread by the good citizens. It seems the singings were enjoyed by all but the ministers. At the Sixth Guntersville Conference, the "all day singing with dinner on the ground and whiskey in the woods" received a strong condemnation by the Presiding Elder M. E. Butts. He considered the singings as practiced in the country to be most damaging to the cause of Christianity and a dis-organizer of churches. In 1909, the Henryville pastor went so far as to nail the doors of the church closed to prevent a singing. The Trustees, notified, promptly opened the doors to permit the singings to start on time. In the late 19th century, the people of Henryville began to feel the decline of the national economy. While the pay for the pastor was provided, it was often meager and many times raised for a special need by box suppers, pie suppers, ice cream suppers, fish ponds, plays, etc. In fact, these events were good fund raisers for any need, particularly for the school and for church repairs. Not until 1891 do records mention a 'home' for the Henryville pastor. This was provided by Isaac Henry. It is thought that later circuit pastors stayed at the parsonage at the nearby Columbus City until it went burst around 1900. In 1900, Mr. and Mrs. Charlie Seibold gave 1/2 acre adjoining the Henryville church property for a parsonage site. Existing records do not tell of the building of the parsonage, but in the ensuing years, there are a records of a three-room frame parsonage that was used to house pastors, Henryville school teachers and others from time to time. By the early 1900's the frame church building needed repairs. One member recalls the walls leaning and the cedar props tilting. An ice cream supper in 1908 raised $40.00 for the use in repairing the structure. The youth gave an entertainment in 1909 for paint and the church was painted "taking on the appearance of being new." In 1913, box supper proceeds went for the new seats and again in 1919 for covering the Church. A Thanksgiving Program and boxed supper in 1925 took in $36.00. THIS IS OUR HISTORY AS WE KNOW IT.